Wow. I was already a pretty big fan of the new era, but this movie helped it take it up a notch. One of my biggest complaints about the middle-to-late Showa era movies is that they were relying on the same old tropes and story lines, and sometimes even being nothing but clip movies. But GODZILLA VS. BIOLLANTE feels fresh, full of new ideas, characters, plot lines, and even one of the coolest looking adversaries in Biollante. Keeping once again in close continuity with the previous film, Japan has become a little more cautious of the Godzilla threat, with the movie starting off with a new 4-stage warning system. It appears that during the climax of the last movie, Godzilla didn’t die in the volcano as much as he was buried underneath and knocked out unconscious. There have been reports of seismic activity around it, but nothing serious. Meanwhile, scientists of various genetics companies have begun to covet tissue samples of Godzilla as a way to develop new technologies, or in the case of the main antagonist corporation of the movie, Bio-Major, weapons. Dr. Shiragami works for another company doing research in the middle east when his daughter is killed. Five years later, he moves back to Japan to do research with flowers. When various assassins from Bio-Major break into his lab, they unleash something that he has been working on, Biollante, who a freak Godzilla/plant/the DNA of his deceased daughter hybrid. Biollante takes refuge in a lake where it calls out to Godzilla in a strange yell. The rest of the movie deals with two battles with Biollante and the humans trying to stop Godzilla with a Anti-Nuclear Energy Bacteria, which would eat up radiation. It all culminates to a rather impressive end sequences. Apart from having to fight Biollante, Godzilla has to contend with the X-2, a modified, remote control version of the Super X from the previous movie. The biggest improvement is that this new ship absorbs Godzilla’s powerful atomic breath and then shoots the beam back at him a thousand-fold. Taking cues from the darker tone of the movies, the kaiju-on-kaiju is much more pronounced this time. At one point, Biollante shoots a sharp tentacle through Godzilla's hands, it also shot what appeared to be acid straight to Godzilla's face. 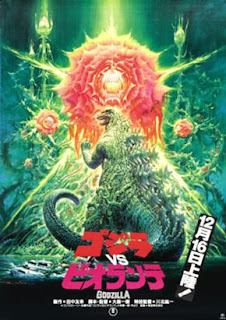 While Biollante starts out as a dopey flower monster, it grows to be a gigantic creature dwarfing Godzilla and possibly being the largest adversary of the franchise yet. And I would like to make a note that this might be one of the best costumes seen so far. Godzilla looks a lot more ferocious and menacing this time around; his teeth look sharper and his dorsal fins and his snout is shorter. The interesting story is that the previously used suit from the 1984 movie was stolen from the Toho studios, so they had to build a completely different one from scratch. The polygonal 3D effect to simulate computer graphics dates the movie, but in terms of the effects with the monsters, they all look much more realistic. It's taken about 30 years, but the scenes with miniatures are starting to look less and less apparent, giving the movie a more seamless flow to the action and destruction sequences. On the human side of things, this actually had the perfect mix of interesting human characters and plots that compliment and add to the story rather than just commenting on it. Dr. Shiragami is definitely a bit of a crazy mad scientist type, but the loss of his daughter makes his persona completely understandable. The whole sub plot of the corporate espionage and the entangling of the Middle East and the American company Bio-Major was interesting given the political climate surrounding both of them during this time. You could certainly see politically allegorical ties to the strained US/Japan international relations during that period due to a trade deficit and a stronger yen. On a final note, the fact that there is a large ethical question about the use of the Anti Nuclear Energy Bacteria and what its effect could have on world politics ties well to the aforementioned political turmoil. As mentioned before, this is a great movie. It takes the franchise in new territory in terms of story, effects, and themes. Plus, Biollante is such an impressive monster that he/she/it steals the show. Here's hoping he/she/it comes back again. The greatest image in all of Godzilla history.